Craig Wise goes in search of ways to be active and have fun as a family. As a self-employed father and husband in an increasingly busy world, I know all too well how easy it is to slip into a habit of hanging out as a family in front of the television, the computer, or just sitting in separate rooms staring at our phones. Exercising as a family doesn’t have to mean running laps or lifting weights, which requires us to set aside blocks of time. If you think about it as leading an active lifestyle with your children, you may be surprised how much activity you can fit in an average week. As a bonus, exercise with family does double duty as quality time – all the more important as we try to squeeze work, family and social duties into our working weeks. As the weather begins to improve with sunny days on the horizon, try setting aside some time for family exercise. The simplest and cheapest activity is to get out into nature and go for a walk. Luckily it’s easy for us here in New Zealand with so many beautiful places to walk, most of which are easily accessible. Exercising outdoors can be done for free unlike costly family trips to the cinema. It gives you time to talk and find out what is going on in your children’s lives. If you don’t have time for a walk, then a trip to the local park or gardens can be just as good. The park also provides space for more vigorous activities, such as football, playing on play equipment (essential for building strength) or just running around. For something more structured try looking for family-friendly classes or sports, for example zumba (great fun as a family) or ballroom dancing (a skill you are never too old to learn). If the weather isn’t good, a trip to the local swimming pool or trampoline park will be popular with the kids. Local centres, such as the YMCA, have family programmes which are reasonably priced. There are always sports available, such as rugby, netball, basketball, volleyball or soccer, through your children’s school or local sports clubs. At primary and intermediate age these games are played for fun and to develop team skills. If you encourage your children to take up an activity when they’re young, they’re more likely to learn to love a sport or active hobby and continue that into their teenage and adult years – what a great gift of future health to give them. We are the biggest inspiration for our children and if we set a good example they will follow. There is no need to be a star netballer or record-breaking marathon runner but just by being active we can encourage that desire in those we inspire. Our family recently went along to the local Brazilian ju-jitsu academy as they offered an hour introduction to let people have a look at what they teach. Martial arts are very popular for a number of reasons and can be taken by both children and adults of all ages (don’t feel shy!). While all the family may not necessarily be in the same class, it gives a common element outside of the home to bring the family closer together. Martial arts can also be good for encouraging self-discipline and self-confidence. You may not find the activity which your children enjoy first time. If they don’t like a certain activity, it’s not the end of the world. Don’t force your children into rugby or swimming just because it’s something which you like, instead take time to find an activity that they really enjoy. You’ll be setting a great example that will show them from a young age how important (and easy) it is to make fitness part of their daily routine. Plus you will be building memories and habits that will last a lifetime. VIDEO FUN. Have your family create their own exercise video where your children are the stars. Everyone will get fitter creating the videos, and at a future time, have fun exercising along with the video over and over again. There will be hours of guaranteed laughter to go with this activity. FIND A WAY TO GIVE. There are a number of charity exercise-related events on throughout the year, eg. fun runs or walks. These are a great way to be active, bond as a family and help a worthy cause. The challenge of training for the event can be fun too. SHAKE IT UP. Take it in turn each week to decide on a physical activity for the family. This ensures that nobody gets bored with the activities and everyone gets an opportunity to do something they enjoy. COMMERCIAL BREAKOUTS. Have a family boot camp during the day. For example, whenever a commercial break comes on the TV, exercise as a family. Try running in place, push-ups, or jumping jacks during each commercial to keep everyone up and moving. Or try the commercial break routine from our previous issue. HAVE A WEEKLY DANCE NIGHT. Just dance! 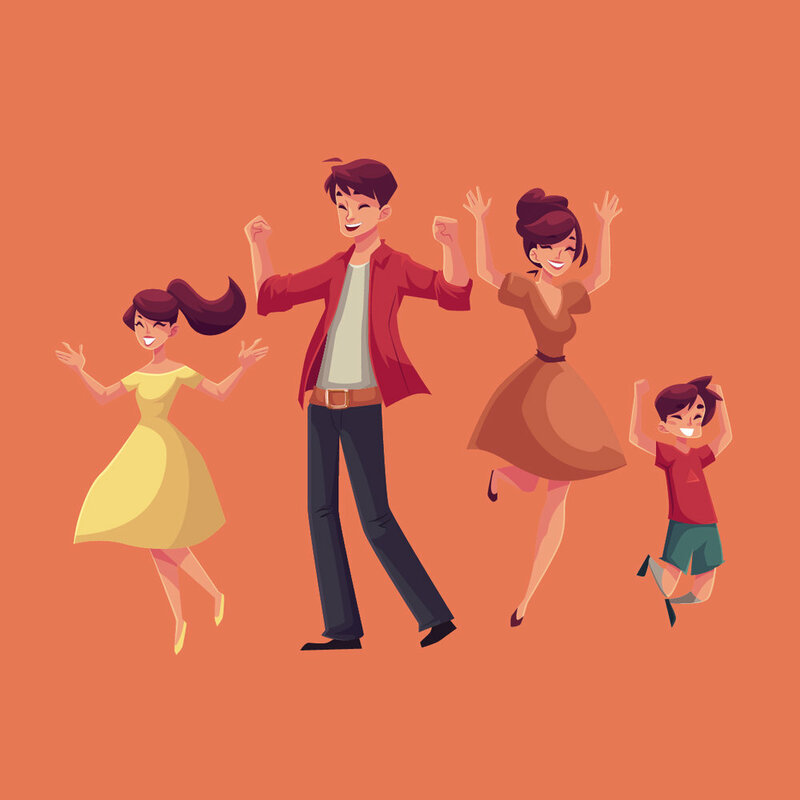 Turn on the radio or stream some fun songs on your phone or tablet and spend time grooving together as a family. Jump around, do a shimmy, shake your limbs and let the giggles come freely. With minimal effort, you can burn some calories and have a super-fun, spirit-lifting family time.